The EZ Wash Solution ComfortSeat is super-easy to install, attaches to just about any toilet on the market and offers all the comfort and health benefits of the Solution ComfortSeat line. Made of high-quality ABS resin, with stainless plumbing, and engineered for long life, you can count this unit for a long time. And when you move or upgrade to a newer seat, this unit can be removed in minutes (just as fast as installing the unit). The EZ Wash Solution ComfortSeat toileting aid, allows users to wash themselves clean with natural water with just the turn of a dial. Relying on water pressure, with an analog dial control for pressure, no electricity is required for operation. 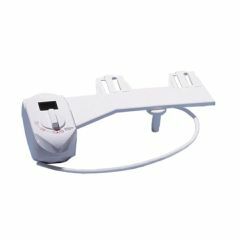 At full power, the unit can provide a lower bowel lavage enema, which can help provide mild constipation relief. The cool-water washing provides immediate relief for hemorrhoids, and helps improve personal hygiene. cold water only. slow to ship. My husband, who has Parkinson's disease, loves his Toto Washlet at home, and was worried about spending over two weeks at a family summer home in Massachusetts without it. So I bought this for the summer house, because it is much less expensive than the Toto and doesn't required an electrical outlet next to the toilet. He was very happy with it. He tends to be very sensitive about temperature so I thought cold water might really bother him (compared to the warm water spray of more expensive units), but he said it was fine. He was also worried about the spray direction not being adustable (the water pressure is adjustable), but he reported no problems. Possible problems: This took three weeks to ship, with no warning of that sent. I don't know if this was an unusual problem or not, but if your need for it is time-sensitive, order early if you can. It does require hooking up to the water line--it is easier installation than most such products because it does not also require an electrical outlet next to the toilet. The control is mounted next to the toilet seat and so more easily could get dirty. None of those were big problems for us, but they might be for someone else. My husband was very happy with this product. adjustable water pressure. moderate cost. I was worried my husband wouldn't like this product because it doesn't heat the water, but he said it was fine. It is very helpful for someone who has difficulty wiping themselves--my husband has Parkinson's disease. I had it installed in a vacation home. I had a plumber do it, but I believe it is quite easy. It doesn't require any electricity, only a connection into the water supply line for the toilet.